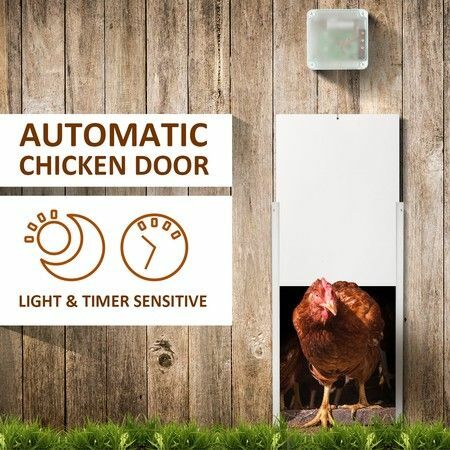 This auto chicken door opener makes your farming life easier, which open in the morning and close in the evening automatically by setting the timer or using the light sensor. All-weather aluminium door and rails coupled with waterproof and UV rated box, it is never rusted or warp and will last for years. The unit has a door lifting capacity of 1.5kg. There are 4 modes you can set. Set time to open and Set time to close. Set time to open and automatically close at Sunset. Automatically open with the morning light and set time to close. Open automatically at sunrise and Automatically close at sunset. 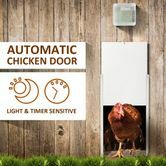 The door opener runs on 4 x AA batteries (not included). And it comes with instructions to make installation easier. 1/ Set Time to Open and Set Time to Close.